Here are six great Bible verses that apply to your life today and every day. Many churches use this as their opening song taken from Psalm 118:24. If you woke up today, then for you, this is the day that the Lord has made and you and I should “rejoice and be glad in it” because God’s given us another day to live for Him and tell about all of the marvelous blessings He has given us. He wants to use us every day as part of the Body of Christ, the church, to do what Jesus would have us do (Matt 25) and at least part of that is to make others know how they might rejoice after repentance and faith in Christ. That should make anyone rejoice and be exceedingly glad! I have a problem with some who told me to “speak to [my] tomorrow” that you will do such and such but there is little biblical wisdom in that because I don’t even know what tomorrow holds or if I’ll even be around for it. I had one man tell me that I should “speak to tomorrow” about how tomorrow will be, as if I had any control over it. I’ve got enough to deal with today without thinking about what I’ll do the next day. Jesus said we’ve already got enough to deal with today than to worry about tomorrow (Matt 6:34) and that’s my thought too. How can we possibly “boast about tomorrow, for you do not know what a day may bring” (Prov 27:1). I’m not saying that we shouldn’t plan what we will do tomorrow but James sees a problem with this is we start to brag about doing this or that tomorrow. I would rather pray to God and ask Him to reveal His will for my life tomorrow than to superimpose my own agenda without consulting with Him. I referred to this verse earlier in James 4 but this verse comes within the context of His commanding us to “not be anxious about your life, what you will eat or what you will drink, nor about your body, what you will put on. Is not life more than food, and the body more than clothing” (Matt 6:25). This is Jesus’ attempt to reduce our anxieties which come so easily to us. If we would only stop and look at the creatures He’s created and how He provides for them and knowing we are “of more value than they” (Matt 6:26), we might stress a bit less. This one is one of my favorite memory verses because it speaks of the urgency to be saved today. This verse establishes the fact that today is the only day of salvation. It is what some call the “age of grace” while others call it the “church age” but I would call it the “taking advantage of today” age. This is the most favorable time of all to be saved. Paul is saying today “is the day of salvation,” not “a day of salvation” as some cults suggest. Some false religions teach that if we die outside of faith in Christ, we’ll get a second chance but I can’t find it in Scripture. What I do find are dozens of Scriptures in the Old and New Testament that refer to the time of salvation as being today, while we are still drawing a breath. As long as we’re breathing, God’s grace is still available to us, however “it is appointed for man to die once, and after that comes judgment” (Heb 9:27). It is not “after death, then comes grace.” No one gets a mulligan in this life. To encourage you, I want to leave you with this verse today or write it down on a sticky note and post it or just keep it with you. It was when God was reassuring Joshua that no one would “be able to stand against” him for the rest of his life. God may have been thinking about the pagan nations living in the land of promise. These were skilled warriors who had formidable fortresses but God says that He would never leave him and never forsake him and would be with him, every step of the way. God also promised Joshua that He would be with him just like He was with Moses. Remember that this was a time of great change for the nation of Israel. Moses had been the only leader they had ever known and he had just died (Joshua 1:2). Israel was now under the new leadership of Joshua. Add to that, they were about to enter the Promised Land and many pagan armies would be opposing them. Since fear is highly contagious, most of Joshua 1 is full of encouragement so that Joshua would in turn encourage Israel. I hope you have a daily Bible reading plan. Since the Old Testament is about twice as large as the New Testament, I have determined to read twice as much in the Old Testament than in the New Testament every day. I set aside time each morning. I strongly suggest you take time to get into the Word of God every day so that your “today” can be lived on the strength of your daily bread from the Bread of Life, Jesus Christ, Who will not only abide with you but also abide in you (John 15:1-1). I believe that’s a worthy goal for today. 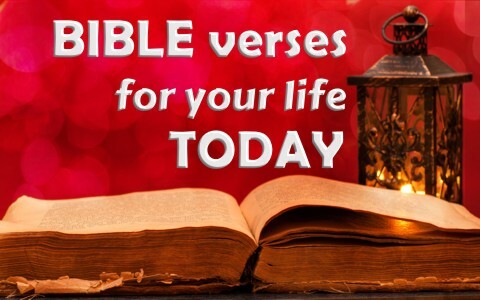 Related reading: What is a Life Verse? Brother Jack I am requesting prayer for my sons and grandkids. The next month is going to be almost unbearable. We are on prayer chains now but I would also like for you and the other writers and even readers to pray for us also. I am praying for a miracle and Gods peace and believe in the power of prayer especially in numbers. Thank you and God bless all of you, Joni. Hi Joni…yes, will pray my friend. For God, nothing is impossible. Previous post: What Does The Bible Say About Adventure?